To many Skomer and Puffins go together, but there is more to Skomer than the Puffins that the majority of the visitors go out to see, with colourful flower displays, other wildlife including a variety of birds, seals, rabbits and its own sub species the Skomer Vole, a subspecies of the Bank Vole. When I visited I took photographs of a wide variety of birds, many of which I had never seen before as well as a Peregrine, Seals and of course many cards full of Puffins. 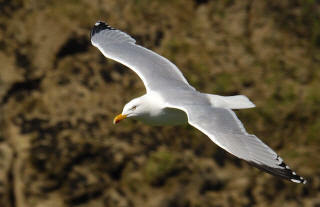 It is the second largest island in Wales, after Anglesey, and one of the most important wildlife sites in Europe. Skomer lies just off the Pembrokeshire coast, separated from the mainland by the turbulent waters of the Jack Sound. Skomer measures 730-or-so acres (292 hectares) is 2 miles east to west, and almost 1.5 miles, north to south. The central ridge of the island reaches 260 feet high. 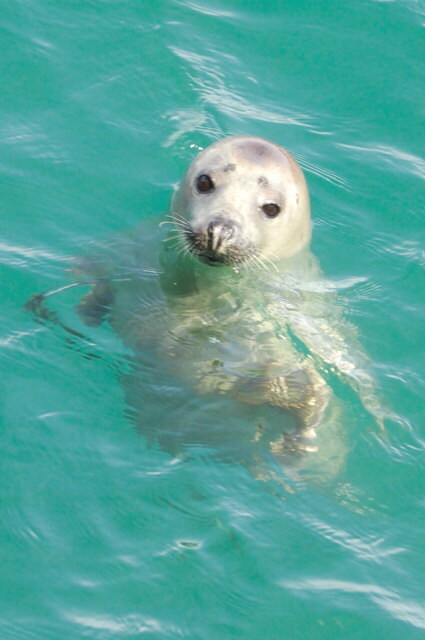 On a calm day the waters of Skomer are crystal clear. 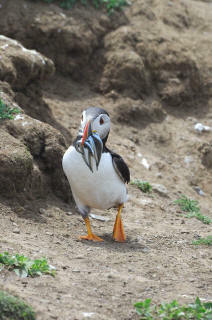 Skomer’s waters are Wales’ only statutory Marine Nature Reserve, and one of only three in the UK. Coral grows offshore, fed by the rich flow of the warm Gulf Stream. Over seventy species of sponges have been recorded here. During Springtime, Skomer is carpeted with flowers: Bluebells as far as the eye can see, coastal flowers (sea and red campion, pink thrift providing many red, white and pink flowers), and with no trees on Skomer this presents a wonderful coloured carpet for the birds to land on. Autumn brings purple heather and yellow Ragwort. It has a great diversity of wildlife due to its geography. Half a million seabirds nest here each year. The island's isolation has meant that mammalian ground predators such as rats, cats, dogs and foxes are absent. This is one of the major reasons for the island's importance as a breeding ground for burrow nesting seabirds. 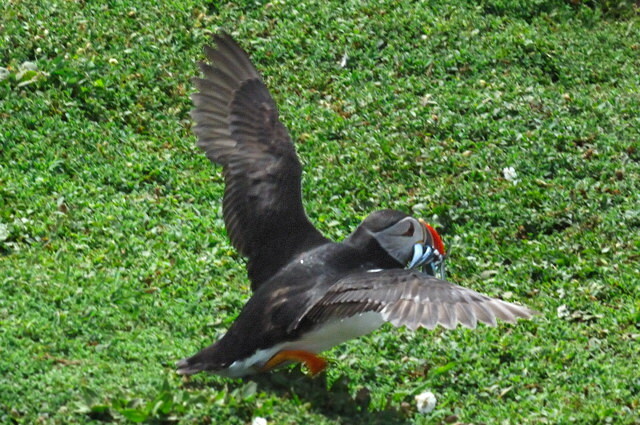 Puffins can be seen on Skomer from April until August, though in early April they may be here in large numbers on one day with none the next, until they settle mid-month. Mid-June to mid-July is the best time to see and photograph big numbers, with around 6,000 pairs present, as parents are busy delivering food for their chicks. Numbers are also swelled then by birds too young to breed but are prospecting for the future. By the first week in August only a handful remain, and these are soon to depart, leaving the Puffin colonies deserted again until the following spring. Skomer is probably the most important breeding site of Manx Shearwaters in the world, with an estimated population of 165,000 pairs. It is difficult to find spots on the island which are not burrowed by them, the rabbits and Puffins. The night time is also dramatic as tens of thousands of nocturnal Manx shearwaters return to their burrows, skimming the air like half-seen shadows and tumbling clumsily to the ground. With so many birds all calling at once, the intensity of their discordant cries smothers the island in a blanket of noise. Other birds present in large numbers are Guillemots (14,000 individuals), Razorbills (3,500 individuals), Fulmars (700 pairs) and gulls, Kittiwakes (2,000 pairs), the smallest, the Lesser Black-backed Gulls (11,000 pairs), Herring Gulls (460 pairs) and the enormously big Great Black-backed Gulls (over 80 pairs), Curlews, Short-Eared Owls (who prey on the unique Skomer Vole), Buzzards, Kestrels, Peregrine and Oystercatchers also make their home here. Midland Island, which separates Skomer and the mainland, is home to a colony of Shags (over 30 pairs). About 16 pairs of Cormorants nest on the Mew Stone, to the south of the island. Visiting birds use Skomer as a stop-over, amongst others Finches, Skylarks, Swallows, Chiffchaffs and Meadow Pipits, as well as the occasional rare bird such as the Golden Oriole, Tawny Pipit, a variety of Warblers, the Black Stork and the Frigate Bird. But of course a lot of these will not be seen by the day visitor. There are a very large number of rabbits. They were introduced around 1400 AD as a source of meat and fur. 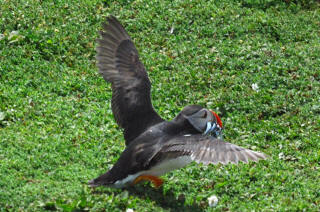 They have burrowed the island extensively, to the advantage of the Shearwaters and Puffins, which nest in burrows. Bigger species of gulls feast on the rabbits and the other interesting mammal on the island, the Skomer Vole, a subspecies of the Bank Vole. It is unique to the island, and there's a unique opportunity to see all three species of Stick Insect. Grey seals (around 200) can be seen most if not all of the time, and found breeding around Skomer every Autumn. They are outnumbered in Wales only by the colony which breeds around Ramsey Island, not too far away to the north, just off the coast at St. David's. 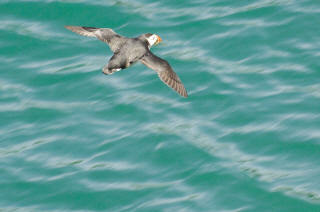 Porpoises and Dolphins can be seen off Skomer almost all year round. Look for Gannets fishing (they prefer the same fishing grounds) and try to spot the inconspicuous dorsal fins, the tidal races around the island are the best places to go. Evidence of occupation by man from the Iron Age onwards is abundant, most of Skomer is an Ancient Monument. The island is believed to have supported an Iron Age community of up to 200 people. From the 7th century on a modern field system was gradually put in place in the centre of the island, which has supported a single farm until 1950. 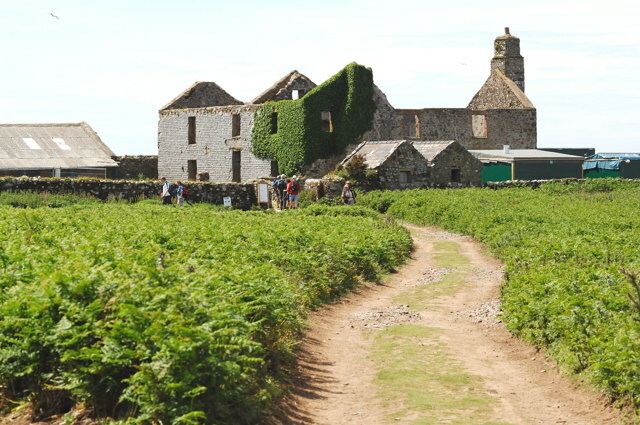 In the early 1800's a farmhouse was built in the centre of the island, but by about 1880 refrigerated steam ships began bringing in meat and dairy produce from overseas and farming on Skomer was no longer profitable. In 1954 a great storm badly damaged the roof of the farmhouse which, not repaired, soon caused the building to become a ruin. Recently plans were put forward to restore the farmhouse. Some of the outbuildings are currently in use as accommodation for visitors and volunteers working on the island. A small number of paying visitors are allowed to stay the night in self catering accommodation run by the Wildlife Trust South & West Wales. One of the attractions is the experience of over 300,000 Manx Shearwaters arriving together all calling at the same time in the dark. You can see 14 more pictures taken on Skomer in the rotator on our Where to Photograph Puffin List and more on How to Photograph Puffins. You can visit the island as a day visitor from 1st April to 30th September and to get there you have to take a 15-20 minute boat ride from Martins Haven. There are two parts to the entry fee a Landing Fee which is paid a Lockley Lodge and a Boat Fare which is paid on the boat in cash. Whilst you are waiting for the boat you can take a look at Lockley Lodge which has an exhibition of the Marine Nature Reserve, and viewing screens linked to remote cameras watching the wildlife activity on the island as well as exploring the Deer Park. For details on Lockley Lodge. 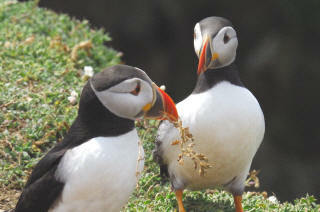 For Puffins mid June to mid July, spring for flowers. Ferry from Martin's Haven - times under opening hours below. Prices also below. Martin's Haven is a small cove situated two miles on from the village of Marloes. From early Spring until late Autumn daily (except Mondays) landings depart from the small harbour at Martin's Haven on the Marloes Peninsula except when weather conditions are adverse. Both on Skomer and the mainland the landing areas are situated on the Northern shore, which makes for uncomfortable - if not downright dangerous - landing conditions in strong Northerly winds. 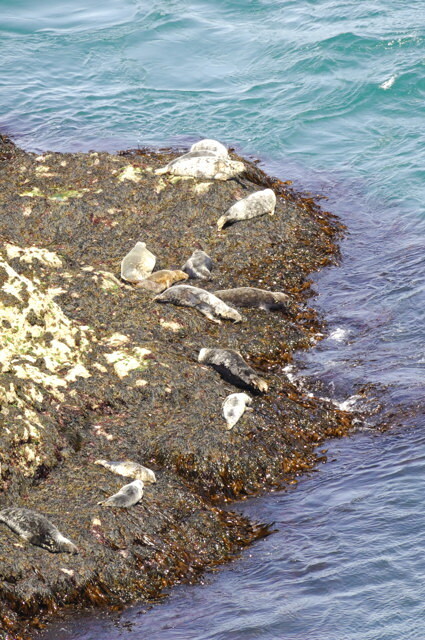 The 15-20 minute trip on the Dale Princess from Martin's Haven to Skomer and back takes you across part of the Marine Nature Reserve which now encircles the island. Sailings may be disrupted by the weather - check by calling Lockley Lodge (01646 636234), Dale Sailing (01646 603123) or the Dale Princess (07831 659623). If staying on the island then for overnight security you can use West Hook Farm about 1/4 mile from the Haven. West Hook Farm charges (in 2010) £3 per day, £5 for overnight stay and £12 a week, prior arrangement should be made with the Thomas family (01646 636424). Birds, seals, plants, island views, paths of varying sizes including track sized but no roads. Open to Public 1 Apr-31 Oct (weather permitting). Sailings to Skomer are weather dependent (see also access). Day visits take place Tuesday to Sunday (and Bank Holiday Mondays). 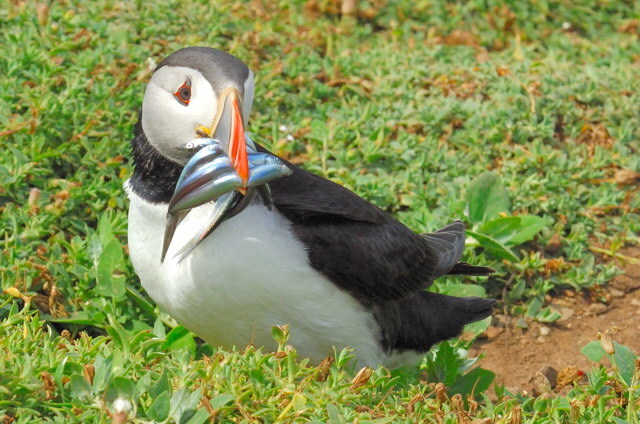 Skomer caters for up to 250 visitors each day, via a 15-20min boat ride from Martin’s Haven departing at 10am, 11am, and 12noon. Return boats generally run 3pm-4pm, the boatman will advise on the day. Adults £10, Concessions £9; Children (5-16) £5 and under 5 FREE, Members Free. Max 250 limit on visitors a day, first come basis, no pre-booking available for Day Visits. A decision is made at 8.30am on whether a crossing is possible due to weather conditions. You have to keep to paths, the island is riddled with burrows and going of path could cause you injury, and squash puffin and other chicks. Special Needs Access: Challenging move from boat to landing place, and very steep climb, plus paths that are not easy to use in places make this completely unsuitable for anyone who has difficulties.